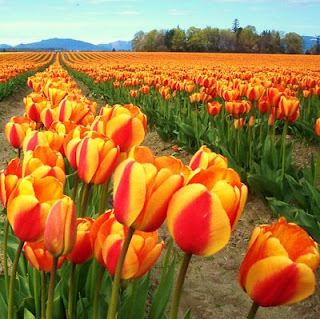 I lived in Seattle for about eight years, during that time I was fortunate enough to be able to attend the Skagit valley tulip festival almost every year! I have to say that it is truly one of the most magnificent sights I’ve ever seen! 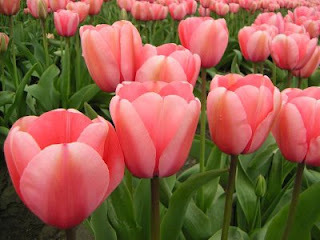 It’s best to visit the Tulip Festival during the week when their are less crowds. If you go on the weekends you will deal with more traffic and crowds. Once you get through town and into the tulip field areas, the traffic is not too bad. The Skagit Valley is 60 miles north of Seattle, Washington, 60 miles south of Vancouver, British Columbia. Traveler’s can take I-5 and then use Exits 221 – 236, all of these exits have tulip brochures at the nearest business. 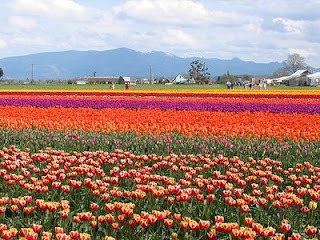 The tulip fields are spread out over a 15-mile radius and tulip festival events are scattered around the entire county. There are many festival sites, It’s a good idea to pick up the free Skagit Valley Tulip Field Map for locations of the tulip fields. Checking out their site and maps will help out in planning your day trip to one of the most colorful and spectacular display in the Northwest corner of Washington State. If you live in the Northwest or you are visiting the Seattle area during the month of April, I highly recommend a day trip to the Skagit valley! I’ve never heard of that. Sounds wonderful. These pictures are so beautiful! I really like the pink one, it looks so dreamy. Oh, what incredible beauty! What a treat to witness this in person. Reason number 563417654 why I need to leave the frozen tundra of Minneapolis for the awesomeness of Seattle. I visited for a week a couple years ago and I still think about it every day. Have you ever been to to iris farm? Stunning Cyd, & it looks like the skies co-operated as well! It has to be breathtaking to see solid colourfields such as these!